(Family crests). Individually researched. COAT OF ARMS. and you have an impressive and very acceptable gift. 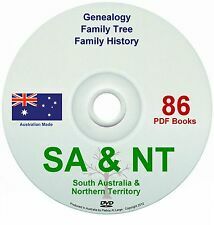 The South Australian and Northern Territory History and Genealogy Collection – if you are researching your family links, doing your family tree, or if you just love history – this collection is for you! Even wills and court records. And a selection of books about Scotland and its history will show you how people lived. 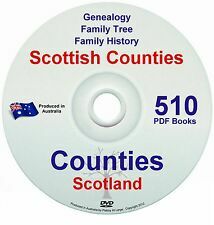 The Scottish History & Genealogy Collection. The Scottish History and Genealogy Collection. IGI BIRTHS/CHRISTENINGS & MARRIAGES FOR KENT ENGLAND. Up for sale are 55 microfiche for Kent England. 1870 -1800's. The microfiche are in good condition, they are used and are mine. They are a very good source for researchers. Ref No F06 24 Cullinanes Of Gympie Queensland 27. Photos are of the actual item you will receive. Size about 13 x 21 cm. Ref No F1 43 Patons & Baldwins. Woolen Mills, Launceston. North, Richard & Heyward, Architects 164. Patons & Baldwins. North, Richard & Heyward, Architects. Unique one of a kind gift idea. Add it to your collection. Ref No F8 02 Lars Halvorsen ,Boat Builder. Neutral Bay, NSW 33. Lars Halvorsen ,Boat Builder. Neutral Bay, NSW. I don't have a firm date on this item. I suspect it is closer to 1937 than 1949. Ref No F8 02 Yeates Bros. & Co. Ruthven St ,Toowoomba, Queensland 158. Yeates Bros. & Co. Ruthven St ,Toowoomba, Queensland. Sold as pictured. Old paper item that has surface marks,scuffs,and light creases. Unique one of a kind gift idea. Add it to your collection. Cherish as a part of your family history. Sold as pictured. Ref No F6 08 R J Prowse Fuel & Ice Railway Siding Williamstown 13. THE BEST I CAN SAY IS 1940s - 50s. Unique one of a kind gift idea. Add it to your collection. Cherish as a part of your family history. Ref No F5 17 Everett Corner Service Station Cnr Orrong Cr & Alma Rd Caulfield 25. Unique one of a kind gift idea. Add it to your collection. Cherish as a part of your family history. Sold as pictured. Unique one of a kind gift idea. Add it to your collection. Cherish as a part of your family history. Sold as pictured. Size about 20 cm wide. Ref No F 07 01 C J B Watson. Editor Of The Shoalhaven News 05. C J B Watson. Editor Of The Shoalhaven News. Photos are of the actual item you will receive. Size about 8 cm wide. Ref No F2 26 L. B. Ball, Earthmoving. Kingston Rd. Cheltenham 253. L. B. Ball, Earthmoving. Size about 14x 20 cm. Sold as pictured. Size about 20 cm wide. Unique one of a kind gift idea. Add it to your collection. Cherish as a part of your family history. Sold as pictured. Alexander Rackets 152. Alexander Rackets. Unique one of a kind gift idea. Add it to your collection. Cherish as a part of your family history. Size ABOUT 20 cm wide. Sold as pictured. Ref No F7 03 Malcolm Wackett. Margot Draffin. Panton Hill. North Balwyn 294. Malcolm Wackett. North Balwyn. Unique one of a kind gift idea. Add it to your collection. Ref No F1 43 Blackett & Forster. Blackett & Forster. Sold as pictured. Ref No F5 08 Watkins Cottrell Co RIchmond Virginia 89. Sold as pictured. Size about 20 cm wide. Ref No F5 10 M Laurier & Sons 10 - 10a Adderley St. St Leonard's Rd Poplar London 24. M Laurier & Sons 10 - 10a Adderley St. St Leonard's Rd Poplar London. Size about 20 cm wide. Sold as pictured. Ref No F5 08 Mackie & Son Holbrook NSW 135. Sold as pictured. Size about 12 cm wide. Old paper item that has surface marks,scuffs,and light creases. Sold as pictured. Antique Original printed advertising. Unique gift idea. Add it to your collection. Cherish as a part of your family history. Ref No F5 11 Miller Brothers 162 High St St Kilda 09. Sold as pictured. Photo of the actual item you will receive. Unique one of a kind gift idea. Add it to your collection. Cherish as a part of your family history. Ref No F2 26 Edward Kenny. Australian Olympic Council. Australian Rowing Council 322. Edward Kenny. Australian Rowing Council. Sold as pictured. Ref No F5 20 Siddely Deasy Sunshine Motor Cars 142. Sold as pictured. Ref No F7 03 Hanna Brothers. Devonshire Pde. Essendon 121. Hanna Brothers. Unique one of a kind gift idea. Add it to your collection. Cherish as a part of your family history. Sold as pictured. 386 Glenferrie Rd. Malvern 300. Unique one of a kind gift idea. Add it to your collection. Cherish as a part of your family history. Sold as pictured. Stoneware Pipes 25. Stoneware Pipes. Unique one of a kind gift idea. Add it to your collection. Cherish as a part of your family history. Sold as pictured. Ref No F5 08 Mackie & Son Holbrook NSW 129. Sold as pictured. Size about 12 cm wide. Ref No F5 08 Mackie & Son Holbrook NSW 128. Sold as pictured. Size about 12 cm wide. Frederick J Cato. Stawell, Pleasant Creek. Morgan & Cato. Rosella. Tooronga Rd. Ref No F7 01 Frederick J Cato. Stawell, Pleasant Creek. Morgan & Cato. Tooronga Rd. Hawthorn 317. Frederick J Cato. Sold as pictured. Ref No F 07 01 John Noake. Alhambra Music Hall. Lawler's. William Walter Chick of Ellalong 18. John Noake. William Walter Chick of Ellalong. Photos are of the actual item you will receive. Ref No F5 08 W S Donnan Hardware Richmond Virginia ,F Conner, H Keck 93. Sold as pictured. Size about 20 cm wide. Ref No F5 17 Vealls Electrical & Radio 520 Bridge Rd Richmond 28. Sold as pictured. Size about 20 cm wide. Ref No F1 44 John Ball, Werribee Farm 27. Sold as pictured. Antique ORIGINAL 1928 print advertising. Unique one of a kind gift idea. Add it to your collection. Cherish as a part of your family history. Princess Cream Separator 23. Princess Cream Separator. Unique one of a kind gift idea. Add it to your collection. Cherish as a part of your family history. Sold as pictured. Nock & Kirby ,417 - 421 George St Sydney. Ref No F8 02 Nock & Kirby ,417 - 421 George St Sydney. Sold as pictured. Old paper item that has surface marks,scuffs,and light creases. Unique gift idea. Add it to your collection. Cherish as a part of your family history. W Garling ,Mason Brothers. Foley's Sydney Gymnasium. Fennelly's Horse & Cattle Bazar 20. Fennelly's Horse & Cattle Bazar. Sold as pictured. Photos are of the actual item you will receive. Ref No F5 20 Coburg & Footscray Amateur Athletics K W Norman 325. Sold as pictured. Ref No F5 22 J Marks 370 CHapel St South Yarra ,The Fur King 29. Unique one of a kind gift idea. Add it to your collection. Cherish as a part of your family history. Sold as pictured. Ref No F8 02 R Jackson, Eagle St Brisbane, Queensland 177. Size about 12 x 11 cm. Sold as pictured. Old paper item that has surface marks,scuffs,and light creases. Ref No F1 45 Langlands & Co. Horsham, Victoria 79. Langlands & Co. Horsham, Victoria. Sold as pictured. Prince Of Wales Hotel, Nowra, NSW. Walter P Watson . Walter P Watson. I don't have a firm date on this item. I suspect it is closer to 1937 than 1949. I can state with certainty, it is not earlier than 1937 . Unique gift idea. Add it to your collection. Ref No F7 01 Turner & Turner Baristors & Solicitors. Turner & Turner Baristors & Solicitors. Sold as pictured. F. H. Edwards, Real Estate Agent. Deakin Ave. Mildura. Ref No F1 45 F. H. Edwards, Real Estate Agent. Deakin Ave. Mildura. F. H. Edwards, Real Estate Agent. Sold as pictured. Photos are of the actual item you will receive. Size about 19x 27cm. Tracing your ancestors is a fascinating exercise. On eBay, you can find a wealth of resources to help you, so you don't have to reinvent the wheel. Family history buffs can find genealogy supplies for digging into your family's rich past. Researching family history using genealogy software and archival supplies can be a massive help, providing you with fascinating information about your ancestors in the comfort of your own home. Get a helping hand from textbooks, charts, family tree software, maps, data CDs, and binders. Genealogy is the study of the history of past and present family members. This can involve creating a record or table of the descent of a person, family or group from an ancestor or ancestors. Whether you're just beginning to trace your family tree or you're a family historian with countless years of carefully collected knowledge of your ancestry, your story is waiting to be told. Researching family history is a favourite hobby for many people. 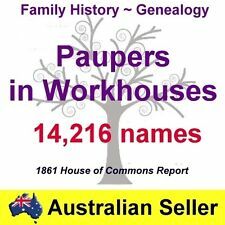 Whether you're exploring family links, doing your family tree or are a keen family historian, you'll find the perfect archive of supplies on eBay. 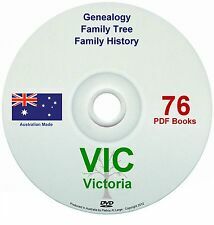 You'll uncover data CDs that contain material of every sort, including census records, records as early as the 13th century, and other essential chronicles for people fascinated by family history. 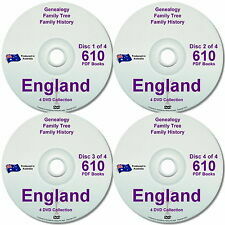 Unearth genealogy CDs that let you build your family tree. Binders are wonderful for presenting your family history and holding certificates, documents, and photos. 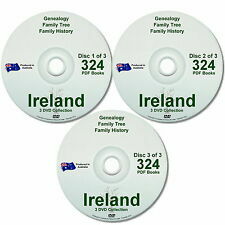 Genealogy books cover everything from software manuals to tracing your family history on the internet. Charts and tree designs are great for displaying your family tree in style whilst storage boxes are brilliant if you have objects and memorabilia that won't fit in a binder but want to protect them from getting damaged. If you need help or advice about a specific area, or you're not sure how to get started, rest assured that you can find plenty of useful books and resources are the ultimate addition to your research.